Previous studies demonstrated dysregulation of different microRNAs in thyroid cancer. Tetraspanins (TSPANs) are cell surface proteins with critical roles in many cellular processes, and implications in tumor development. Here we investigated the role of miR-369-3p in papillary thyroid cancer (PTC) and its association with TSPAN13. miR-369-3p and the TSPAN13 gene expression profiles of 513 thyroid cancer and 59 normal thyroid tissues were downloaded from the Cancer Genome Atlas database. Thyroid cancer tissues were classified according to the histological type, grouped based on low and high median miR-369-3p and TSPAN13 expression, and analyzed in relation to overall survival (OS) of patients. Human PTC cell lines (TPC-1 and GLAG-66) and human embryonic kidney 293T (HEK293T) cells were used for in vitro analysis. Transfection experiments were performed with synthetic miRNA mimics for miR-369-3p and small interfering RNAs for TSPAN13. Relative expression of miR-369-3p and TSPAN13 mRNA was determined by RT-qPCR. Protein levels of TSPAN13 were determined by western blotting. Cell proliferation (CCK-8 assay), colony formation, and apoptosis (flow cytometry) were analyzed in transfected cells. Binding sites of miR-369-3p in TSPAN13 mRNA were determined by bioinformatics analysis and dual luciferase reporter assay. miR-369-3p was downregulated and TSPAN13 upregulated in PTC, follicular thyroid cancer, and tall cell variant tissues. Both low expression of miR-369-3p and high expression of TSPAN13 were associated with shorter OS in thyroid cancer patients. Overexpression of miR-369-3p significantly suppressed proliferation and promoted apoptosis in PTC cells. TSPAN13 was a direct target of miR-369-3p, and silencing of TSPAN13 phenocopied the effect of miR-369-3p mimics in PTC cells. Overall, the downregulation of miR-369-3p and consequent upregulation of its target TSPAN13 appear to be involved in pathophysiology of PTC. DeSantis CE, Siegel RL, Sauer AG, Miller KD, Fedewa SA, Alcaraz KI, et al. Cancer statistics for African Americans, 2016: Progress and opportunities in reducing racial disparities. CA Cancer J Clin 2016;66(4):290-308. https://doi.org/10.3322/caac.21340. Xing M, Alzahrani AS, Carson KA, Viola D, Elisei R, Bendlova B, et al. Association between BRAF V600E mutation and mortality in patients with papillary thyroid cancer. JAMA 2013;309(14):1493-501. https://doi.org/10.1001/jama.2013.3190. Tuttle RM, Haddad RI, Ball DW, Byrd D, Dickson P, Duh QY, et al. Thyroid carcinoma, version 2.2014. J Natl Compr Canc Netw 2014;12(12):1671-80; quiz 80. Miller KD, Siegel RL, Lin CC, Mariotto AB, Kramer JL, Rowland JH, et al. Cancer treatment and survivorship statistics, 2016. CA Cancer J Clin 2016;66(4):271-89. https://doi.org/10.3322/caac.21349. Al Eyadeh AA, Al-Sarihin K, Etewi S, Al-Omari A, Al-Asa'd RA, Haddad FH. Thyroid cancer post radioactive iodine treatment for hyperthyroidism - case series and review of the literature. Endokrynol Pol 2017;68(5):561-6. https://doi.org/10.5603/EP.a2017.0037. Iyer NG, Morris LG, Tuttle RM, Shaha AR, Ganly I. Rising incidence of second cancers in patients with low-risk (T1N0) thyroid cancer who receive radioactive iodine therapy. Cancer 2011;117(19):4439-46. https://doi.org/10.1002/cncr.26070. Xing M. Molecular pathogenesis and mechanisms of thyroid cancer. Nat Rev Cancer 2013;13(3):184-99. https://doi.org/10.1038/nrc3431. Bulotta S, Celano M, Costante G, Russo D. Emerging strategies for managing differentiated thyroid cancers refractory to radioiodine. Endocrine 2016;52(2):214-21. https://doi.org/10.1007/s12020-015-0830-4. Iorio MV, Ferracin M, Liu CG, Veronese A, Spizzo R, Sabbioni S, et al. MicroRNA gene expression deregulation in human breast cancer. Cancer Res 2005;65(16):7065-70. https://doi.org/10.1158/0008-5472.CAN-05-1783. Yekta S, Shih IH, Bartel DP. MicroRNA-directed cleavage of HOXB8 mRNA. Science 2004;304(5670):594-6. https://doi.org/10.1126/science.1097434. Cheng AM, Byrom MW, Shelton J, Ford LP. Antisense inhibition of human miRNAs and indications for an involvement of miRNA in cell growth and apoptosis. Nucleic Acids Res 2005;33(4):1290-7. https://doi.org/10.1093/nar/gki200. Fuziwara CS, Kimura ET. MicroRNAs in thyroid development, function and tumorigenesis. Mol Cell Endocrinol 2017;456:44-50. https://doi.org/10.1016/j.mce.2016.12.017. Celano M, Rosignolo F, Maggisano V, Pecce V, Iannone M, Russo D, et al. MicroRNAs as biomarkers in thyroid carcinoma. Int J Genomics 2017;2017(4):6496570. https://doi.org/10.1155/2017/6496570. He H, Jazdzewski K, Li W, Liyanarachchi S, Nagy R, Volinia S, et al. The role of microRNA genes in papillary thyroid carcinoma. Proc Natl Acad Sci U S A 2005;102(52):19075-80. https://doi.org/10.1073/pnas.0509603102. Lee JC, Zhao JT, Clifton-Bligh RJ, Gill A, Gundara JS, Ip JC, et al. MicroRNA-222 and microRNA-146b are tissue and circulating biomarkers of recurrent papillary thyroid cancer. Cancer 2013;119(24):4358-65. https://doi.org/10.1002/cncr.28254. Ricarte-Filho JC, Fuziwara CS, Yamashita AS, Rezende E, da-Silva MJ, Kimura ET. Effects of let-7 microRNA on cell growth and differentiation of papillary thyroid cancer. Transl Oncol 2009;2(4):236-41. https://doi.org/10.1593/tlo.09151. Guo S, Zhang W, Wei C, Wang L, Zhu G, Shi Q, et al. Serum and skin levels of miR-369-3p in patients with psoriasis and their correlation with disease severity. Eur J Dermatol 2013;23(5):608-13. https://doi.org/10.1684/ejd.2013.2148. Hao GJ, Ding YH, Wen H, Li XF, Zhang W, Su HY, et al. 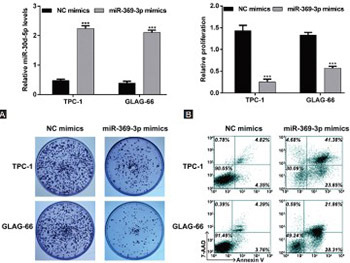 Attenuation of deregulated miR-369-3p expression sensitizes non-small cell lung cancer cells to cisplatin via modulation of the nucleotide sugar transporter SLC35F5. Biochem Biophys Res Commun 2017;488(3):501-8. https://doi.org/10.1016/j.bbrc.2017.05.075. Bassani S, Cingolani LA. Tetraspanins: Interactions and interplay with integrins. Int J Biochem Cell Biol 2012;44(5):703-8. https://doi.org/10.1016/j.biocel.2012.01.020. Richardson MM, Jennings LK, Zhang XA. Tetraspanins and tumor progression. Clin Exp Metastasis 2011;28(3):261-70. https://doi.org/10.1007/s10585-010-9365-5. Veenbergen S, van Spriel AB. Tetraspanins in the immune response against cancer. Immunol Lett 2011;138(2):129-36. https://doi.org/10.1016/j.imlet.2011.03.010. Yamamoto Y, Grubisic K, Oelgeschlager M. Xenopus Tetraspanin-1 regulates gastrulation movements and neural differentiation in the early Xenopus embryo. Differentiation 2007;75(3):235-45. https://doi.org/10.1111/j.1432-0436.2006.00134.x. Hemler ME. Tetraspanin functions and associated microdomains. Nat Rev Mol Cell Biol 2005;6(10):801-11. https://doi.org/10.1038/nrm1736. Chen L, Yuan D, Zhao R, Li H, Zhu J. Suppression of TSPAN1 by RNA interference inhibits proliferation and invasion of colon cancer cells in vitro. Tumori 2010;96(5):744-50. https://doi.org/10.1177/030089161009600517. Otsubo C, Otomo R, Miyazaki M, Matsushima-Hibiya Y, Kohno T, Iwakawa R, et al. TSPAN2 is involved in cell invasion and motility during lung cancer progression. Cell Rep 2014;7(2):527-38. https://doi.org/10.1016/j.celrep.2014.03.027. Nazarenko I, Rana S, Baumann A, McAlear J, Hellwig A, Trendelenburg M, et al. Cell surface tetraspanin Tspan8 contributes to molecular pathways of exosome-induced endothelial cell activation. Cancer Res 2010;70(4):1668-78. Zhou Z, Cai Z, Wang J, Wu J. TSPAN13 is overexpressed in ER-positive breast cancers and contributes to tumor progression. Int J Clin Exp Pathol 2016;9(6):5980-8. Lou J, Huang J, Dai XY, Xie Y, Dong MJ, Chen B, et al. Knockdown of tetraspanin 13 inhibits proliferation of colorectal cancer cells. Int J Clin Exp Med 2017;10(4):6387-95. Barbarotto E, Schmittgen TD, Calin GA. MicroRNAs and cancer: Profile, profile, profile. Int J Cancer 2008;122(5):969-77. https://doi.org/10.1002/ijc.23343. de la Chapelle A, Jazdzewski K. MicroRNAs in thyroid cancer. J Clin Endocrinol Metab 2011;96(11):3326-36. https://doi.org/10.1210/jc.2011-1004. Pan W, Yu H, Zheng B, Gao Y, Li P, Huang Q, et al. Upregulation of MiR-369-3p suppresses cell migration and proliferation by targeting SOX4 in Hirschsprung's disease. J Pediatr Surg 2017;52(8):1363-70. https://doi.org/10.1016/j.jpedsurg.2017.04.002. Hou FQ, Lei XF, Yao JL, Wang YJ, Zhang W. Tetraspanin 1 is involved in survival, proliferation and carcinogenesis of pancreatic cancer. Oncol Rep 2015;34(6):3068-76. https://doi.org/10.3892/or.2015.4272. Hemler ME. Tetraspanin proteins promote multiple cancer stages. Nat Rev Cancer 2014;14(1):49-60. https://doi.org/10.1038/nrc3640. Boucheix C, Duc GH, Jasmin C, Rubinstein E. Tetraspanins and malignancy. Expert Rev Mol Med 2001;2001:1-17. https://doi.org/10.1017/S1462399401002381. Arencibia JM, Martin S, Perez-Rodriguez FJ, Bonnin A. Gene expression profiling reveals overexpression of TSPAN13 in prostate cancer. Int J Oncol 2009;34(2):457-63. https://doi.org/10.3892/ijo_00000170.